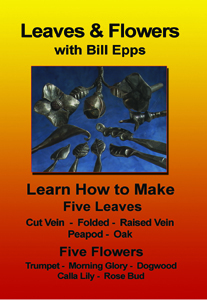 Third in a series, this video features Bill Epps, a Mesquite, Texas blacksmith, demonstrating some of the techniques for making flower and leaf motifs for decorative projects. There are 5 leaves and 5 flowers demonstrated, including several ways of cutting veins into a leaf, folding and shaping the leaf form, and specific blossoms such as a rose, a morning glory, a dogwood blossom and a calla lily. Epps shows how to achieve surface texturing on leaves and petals to give a more naturalistic finish to the product, and discusses the merits of giving just the inference of a specific species, rather than trying for exact replication. The use of the guillotine tool, or top/bottom fuller, is shown. Applications for the individual items shown are discussed, and the viewer is encouraged to find his or her own ways of using these beautiful decorative details. Skilled photography and editing, and a working knowledge of the subject matter are evident in this video, as in all the others by Love of Art Productions. The professional or hobbyist blacksmith will want to add these techniques to his or her repertoire.